It’s getting to be that time of year again. The holidays are around the corner and people are gearing up to get all of their shopping done. In the past, that used to mean a mad dash to the nearest department store to deal with the chaos of large crowds and long lines. Lucky for us, we can now shop online in our pajamas from the comfort of our couch. With e-commerce accounting for 53.3 billion dollars of U.S. sales during the holiday season last year, it seems to be a viable option for a lot of people. Pinterest is hoping to take advantage of e-commerce traffic by making Buyable Pins available to thousands of more businesses. Out of all of the social media platforms, Pinterest has the largest potential for an upswing in e-commerce. This is because in nature the social network already resembles an e-commerce business model. In fact, according to a study performed by Pinterest and Millward Brown, 93% of active U.S. pinners used the site to plan a purchase. On top of that, 87% of people were influenced to make a purchase based on engagement while on the site. Buy Buttons streamline the process and allow pinners to buy products they discover without ever leaving the social platform. If you’re a small business that sells online, that’s a big deal for you. Your products now have the potential to be bought by one of 100 million users on Pinterest. Now all of the above figures sound great. We’re sure the possibilities for Buyable Pins are circling around your head, but before you go and get lost in Pinterest we have 3 tips to make sure you’re off on the right foot. Make sure you’re using high-quality photos. It makes sense that your products have to look nice to be bought. Furthermore, use a variety of photos to see what works… we’re always testing! Maybe consumers are more likely to buy your jacket if it’s being worn vs. being placed in front of a white backdrop. The only way to find out is to test. As visual as Pinterest is, your captions do matter – especially with Buyable Pins. Write content for your pins based on how you imagine customers are using your products. Although you do get 500 characters, try and keep it brief and to the point. Keywords matter when people are searching on Pinterest. After all, it’s how your products will be discovered. You need to know what your target customer is searching for and use related keywords. For example if you sell athletic wear, you may want to choose keywords like “sports”, “fitness” or “competition”. E-commerce has been steadily growing each year and with the holiday season approaching, this year should be no different. Pinterest is in a position to really take advantage of this culture shift. 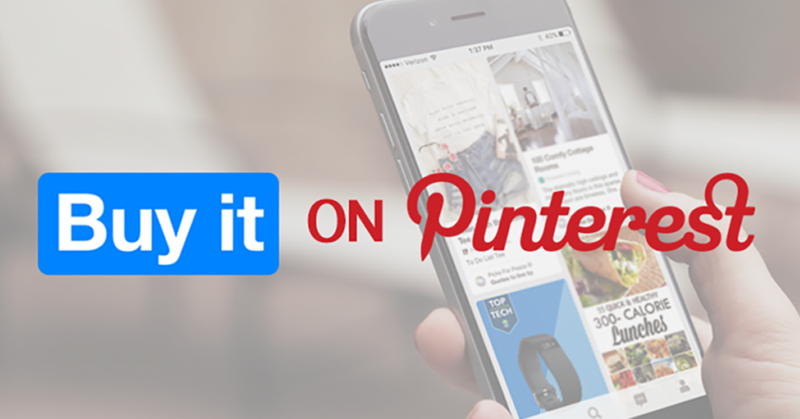 If you’re a business that sells online, get on Pinterest and check out Buyable Pins. You can really benefit by getting an early start and using the tips above.